Talk about being at the right place at the right time. A few months ago, Mark Buchler, who is the “Nerd” behind ModelNerd’s ModelShack, detailed a resin set he was making to update his build of a Lindberg F11C-2 Goshawk kit. He posted several updates on the Fine Scale Modeler forums, and impressed more than a few people with his work. 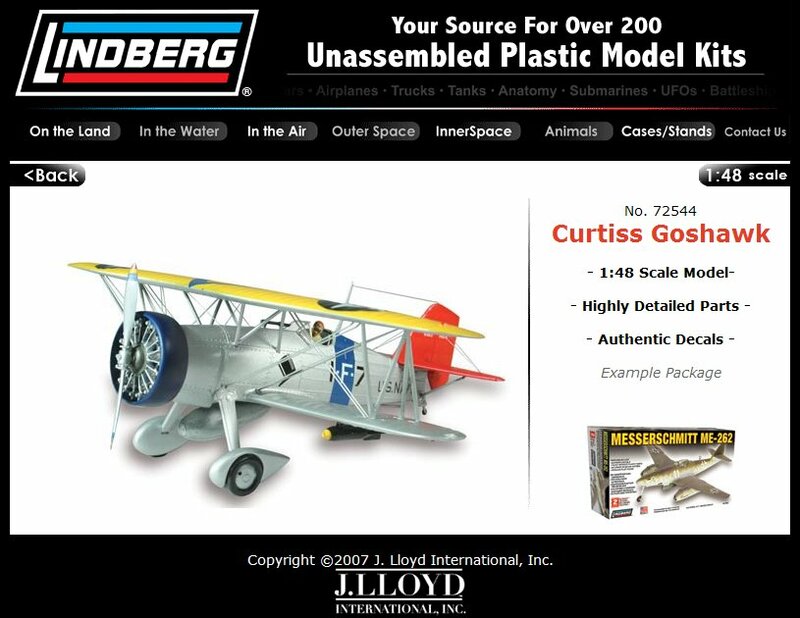 Mark thought more folks might want to make use of his molds, and began selling the parts at his site for anyone who wanted to update their Lindberg Goshawk kit. And in a stroke of great timing- Lindberg kits are suddenly back on the market, including the F112-C Goshawk. 1. The set’s new wheels and wheel farings are the larger, more common type, which were used on aircraft operating from carriers. 2. An engine cowl is provided for those who wish to replace the undersized Lindberg engine/cowl with an aftermarket Wright engine (I recommend the QuickBoost Wright R1820 (#QB48058). 3. A new propellor is provided to replace Lindberg’s undersized propellor. 4. Cockpit components are included, whereas Lindberg’s kit only provides the builder with a highly inaccurate seat. As I’d mentioned in a previous post, Lindberg is back, and has quite a few kits on the market. I’ve even seen some of their kits on the shelves of my local hobby shop, so it’s not just promise- they’re moving plastic. If you’re a fan of Lindberg, Goshawks or Golden Age aircraft, or just like to build slightly off-the-path subjects, you’ll want to check out Lindberg’s F11C-2 Goshawk, and add ModelNerd’s resin update set. The set is very reasonably priced at US$15 plus S&H, and once you purchase the set, you can download some high resolution artwork for a very nice set of decals. Even if you might not think you want to build the kit, I highly recommend reading his account of how he made the parts, his research, and his build progress. It is a great primer on updating a kit, and makes a very interesting read. Also, watch for Mark’s upcoming book on the basics of mold making and resin casting, due to be available in January. Mark said “it will cover “womb to tomb” operations of planning, making your pattern, making your mold, and casting your final part. There will also be a small demonstration on vacuum forming your own canopy. The book is aimed at folks who have little or no experience with this sort of thing.” Keep checking back here- as soon as Mark’s book is released, AgapeModels.com will definetly carry the news! All the details on the Lindberg F11C-2 Goshawk update set, pictures of the pieces, and ordering information are posted on Mark’s site. Be sure and check out some of his other builds- he’s a world-class modeler!